In response to all those who have asked me this question, I thought I would clear up any possible confusion over what exactly a Spoodle is. A Spoodle, also known as a Cockapoo (not so widely used for obvious reasons ) is quite simply a Poodle mixed with a Cocker Spaniel. Cross breeds aren’t actually recognised as a breed at all and in the snobby world of dog breeding there are those who think that if you can’t track your pooches lineage back to Charles 1st, then the dog is nothing more than a designer mutt and simply not worth it’s weight in biscuit. Personally I don’t think that all this pedigree breeding between dogs can be all it’s cracked up to be, something already proved by those family loving 11 fingered hillbillies in the Southern states of the US. A vet actually told me that mixing breeds helps to accentuate the good characteristics of both breeds and eradicate the negative. Hence an ‘Oodle’ is meant to be a highly intelligent dog and some come with a non shedding coat, so great for dog allergy sufferers. Personally I’m not a great fan of vacuuming. It’s time consuming, back breaking and one of those chores that you wouldn’t even notice you’ve done after a couple of hours. So I have to say that a non shedding dog is the perfect pet if you should happen to have dark coloured chairs or carpets. Or really any floor space that you don’t want looking like a barbers shop. Even when Charlie is brushed, which isn’t as often as he probably should be, hardly any fur comes out onto the brush. I reckon if I collected all of the fur from his brush over the course of a year, I might just about have enough to stuff a pin cushion. If you’ve ever had a hairy dog, or have walked away from a friends house with half their dog still stuck to your best cream trousers, then you will appreciate just what a benefit this is. Of course as with so many things in life what you want in a dog all comes down to personal taste and preference. I would rather have a cute crossed mutt than a pedigree poodle that looks like it got a stick stuck up it’s backside, but then that’s just me. I have no canine class and no life long ambition to conquer Crufts. The ‘Oodle’ clan are very popular over here in Australia. Go to any park and you are bound to see one or other of them warming their fur in the sun. Here’s a list of the Poo’s you can cross, even I never realised there were so many. If you can’t quite make him out, he is the slightly fluffier part of the rug with the black eyes, nose and paw pads. His name is Charlie. Also known as Get Off, Get Down, Leave It, Be Quiet, Come Here or Spit. He’s a 15 month old bundle of energy, love and fluff. After his initial puppy training he is fairly well trained and has thankfully now come through the chewing anything and peeing anywhere stage. While he does have many of his doggy manners mastered he still has a migraine inducing bark set off by next doors cat and is highly likely to bolt for freedom if the dog flap isn’t shut quick enough as the garage door opens. He has the energy of a toddler (my dog and son are fairly evenly matched on that count) and will come back from a marathon sprint through the park and then still look at you expectantly as if to imply he has been shut up in a box for weeks on end. He is incredibly picky with his food and considers dog food to be far to unappetising for his educated palate. He tends to loiter under the high chair at meal times and hoovers anything that falls before it has even hit the floor. He makes a very good lap warmer in the cold Perth winter and is at his happiest when stretched out in front of the fire watching CSI. Aaawww…so cute. I think I want another one! Puppy that is. When I cut my mini-poodle’s hair, he often comes out looking like a cocker spaniel (mostly because it’s hard to get his belly). Nice article. It’s really good. 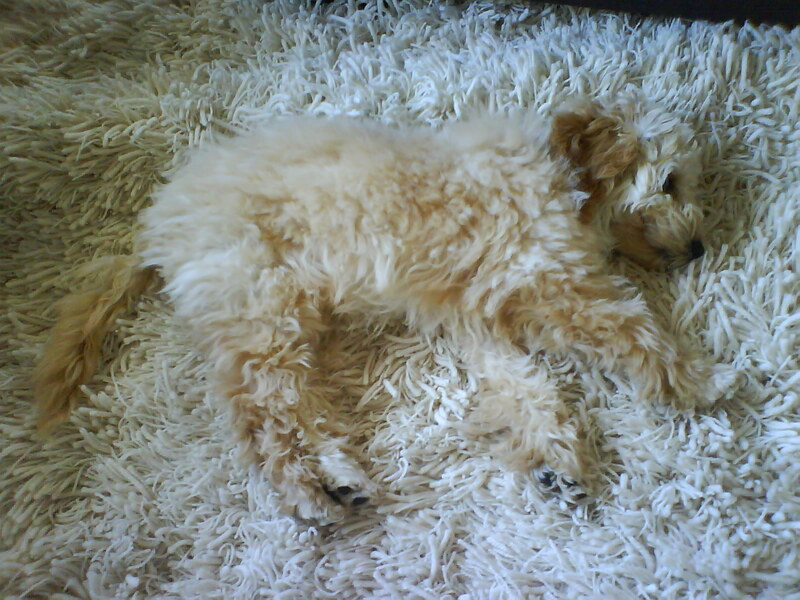 i thought this was my dog, he is the same breed and colour we also have the same mat as in the picture and our dog billie loves it. Wes have had many pets over the years. The mixed breeds have always been the most lovable and friendly. I think they can actually be known as both. In Australia, where Charlie joined our family as a puppy, these mixed breeds are all the rage. You couldn’t go to a park without practically tripping over an ‘Oodle’ before making it a couple of feet from the car! Over there they are known as Spoodles, while here they’re known as Cockapoos. I think I’ll stick with the first, it rolls off the tongue better!! I’m gone to inform my little brother, that he should also go to see this weblog on regular basis to get updated from hottest gossip.